This quote has stuck with me. When learning a language, knowledge is so easily lost if I’m too shy to ask a question, or too arrogant to ask a question that may be perceived as too basic. I’ve been asked the question How do you teach Urdu to your children in America? a few times so thought I’d share how we attempt to teach Urdu to my preschooler (think toddledom is sadly come to an end) Z & now baby A. 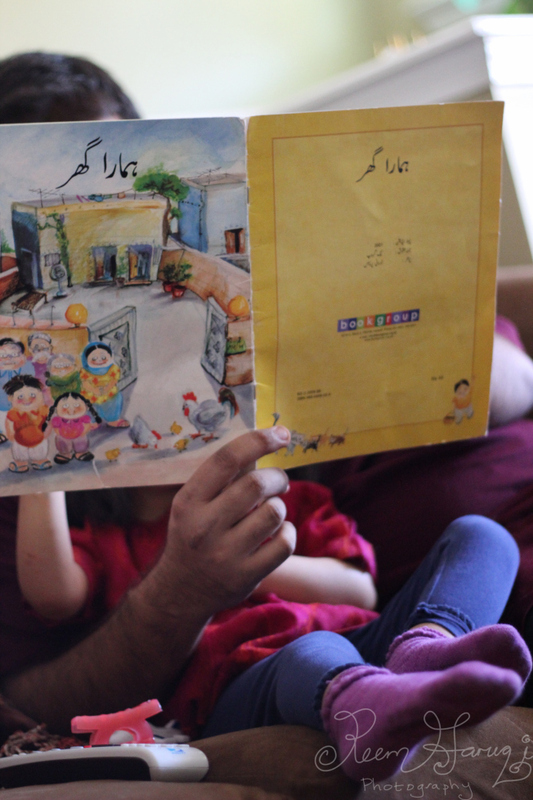 My Urdu has improved after having children as I have been making a conscious effort to speak to them in Urdu and it can be very rewarding to hear your child speak to you in Urdu! Please also share your resources that you use! Urdu Qaida – great nursery rhymes! Hindi Baby Flash Cards – Z learned all her animals from this! Duddoo Aur Dhobi and an article on this app! – this app is interactive and entertaining. The music is catchy! Toffee TV – a wide variety of nursery rhymes, stories, and all in Urdu! Urdu Ustad – beautiful illustrations, GREAT pronunciation, interactive Qaida (letter book). Creator of the app, Adeel Javed, lives in the US and developed this app Urdu Ustad in his free time to teach young ones Urdu alphabet. The main goal of creating this app was to give a good option to families living outside of Pakistan who want their kids to learn Urdu. Goal accomplished! Sim Sim Hamara – Best. Stuff. Ever. This is by far the #1 thing that has really helped Z learn, and me too! Elmo speaking Urdu will never lose its appeal! (at least not for some time). Only thing is they’ve stopped producing new episodes I think, but the videos are beautiful. Hamara Pakistan mini videos for Sim Sim are beautifully produced and capture gorgeous images of Pakistan and feature children of all levels, from rural mountains to busy cities. LOVE these episodes! Burka Avenger – super animated. Urdu is pretty advanced, but the subtitles help, and the themes they cover are pretty big. Z feels for the little girl Ashli when her school is closed and always looks sad for Ashli. Toffee TV – same as above app just in YouTube format. Goldilocks and the Three Bears – in Hindi! – Z loves this video. I play this for her when she’s being really picky at the table, and she gets mesmerized by the story and sometimes eats. Urdu Stories: Dr Farhat’s Al Huda Kids site – songs and stories narrated in Urdu with morals. Pimsleur: I got a cheaper set online from Amazon and it was basic but v.helpful with Urdu grammar! Nunnay Nazmein : book with nursery rhymes and Audio CD that you can listen to in car. My chachi’s mother wrote this book! Published by Oxford University Press. Whenever someone comes from the motherland or Pakistan, we always ask for Pakistani books. My aunt is great at getting us books from Karachi Itvaar Bazaar. Books that are published by The Book Group are great. Below are a few of Z’s favorites and a photo or 2 of her with Hamara Ghar and my cousin Ahmed. Elmer the Elephant series with Urdu translations : perk is that this hardcoverbook has both English and Urdu in the colorful board books. Great for little ones as tear proof! Bul Bul Ka Bacha – great quality hardcover board book. Beautiful text and illustrations! ***Also any book can be an Urdu book! 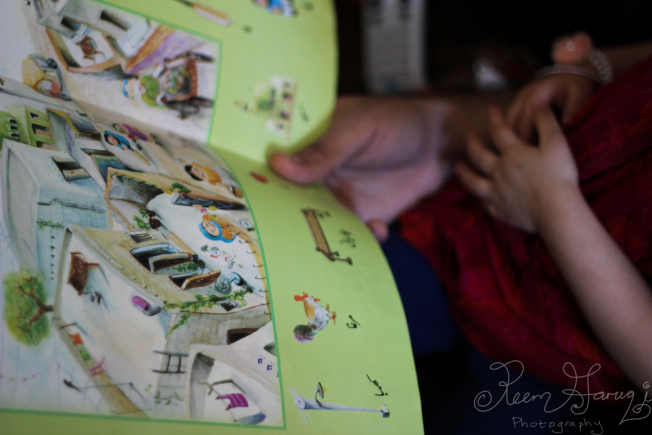 I read English books to Z and A in Urdu–my Urdu is basic, but it works! An amazing resource if you are lucky to have them! My parents speak to Z in Urdu and will correct my Urdu and Z’s Urdu, and will encourage us to keep speaking Urdu. For the out-of-town grandparents, we Skype with and speak Urdu to them. It’s nice to see Z be able to have conversations with them in Urdu! Now that Z is attending school part time, English is the new cool language for her. She only wants to speak English so what was her speaking mostly Urdu now is 80 percent English, 20 percent Urdu. But we keep speaking Urdu to her anyways! My husband and I speak English to each other as it’s easy and our conversations are more advanced. I thought Z would have picked up on English ages ago, but since we both made a big effort to only speak Urdu to her, she immersed herself with that language, and it was really nice to witness her in that stage of Urdu. I really don’t know how long her speaking Urdu will last but hope it continues to do so and that she is still fluent and understands it in life! Just try it because you may be surprised by how much they may pick up and how you may pick up the language too! “O my Lord! Advance me in Knowledge” (Quran 20:114). good job Reem. This is indeed a valuable resource to get it all down in one go! Great going! thanks@! will try to add it :)!